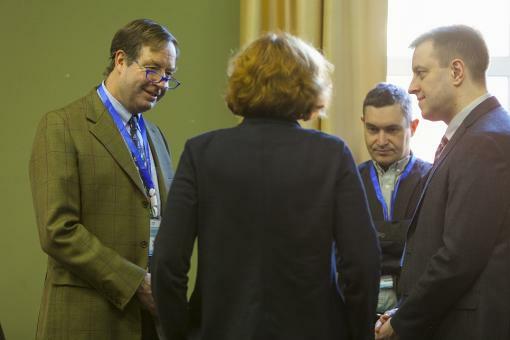 Dr. Tim Flanigan, PI of the Brown University Ukraine Collaboration (BUUC) discusses HIV care for newly detected HIV-positive persons with colleagues at a conference in Kyiv, Urkaine. On February 6-7, 2018, the the Ukrainian Institute on Public Health Policy (UIPHP) hosted a national conference in Kyiv entitled, "Enhancing linkage to HIV care for newly detected HIV-positive persons in Ukraine". The conference was attended by researchers from UIPHP, regional specialists, experts from the Public Health Center of the Ministry of Health of Ukraine and the Centers for Disease Control and Prevention (USA), as well as representatives of the research centers and medical schools of University of California, Columbia University and Brown University (USA). Read more about the conference and see additional photos here.